Captain Walker began his career with the San Bernardino County Sheriff’s Department in July of 1997. During his career with the Department, he has worked a variety of assignments, including Patrol, Narcotics, Gangs, Internal Affairs, and SWAT. He held multiple ranks while assigned to SWAT, during which time he led a tactical team during the Christopher Dorner manhunt in 2013, and was in dual tactical command during the December 2, 2015 terrorist attack in San Bernardino, California. 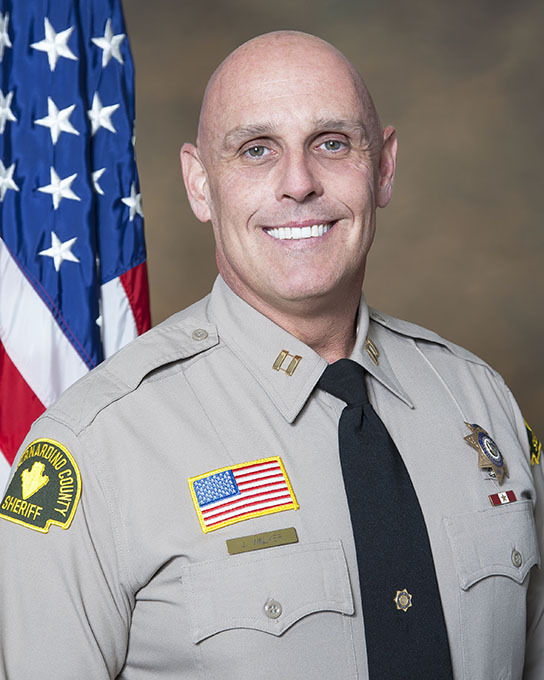 Prior to assuming command of the Chino Hills Station in July of 2018, Walker was the Lieutenant for the Highland Police Department and was responsible for oversight of day-to-day operations. Captain Walker holds numerous professional certificates and memberships, including but not limited to, Peace Officer’s Standards and Training (POST) Supervisory Certificate, POST Management Certificate and Role of the Police Chief. He is also a member of the California Association of Tactical Officers. He is an avid cyclist and a long-time member of the Citrus Valley Velo cycling club which is based in Redlands, California. Captain Walker is also the Vice President of the Sheriff’s Athletic Federation whose mission is to encourage and promote a high standard of physical and mental well-being for all full time, duly sworn law enforcement officers of the San Bernardino County Sheriff's Department, through the sponsorship of athletic competition. Captain Walker values the concept of community policing and looks forward to collaborating with citizens, business owners, and stakeholders to foster and promote positive police/community relations.